KIEV, Ukraine -- The broadcaster presented a concert featuring Russian singers supportive of the separatist movement in Ukraine. 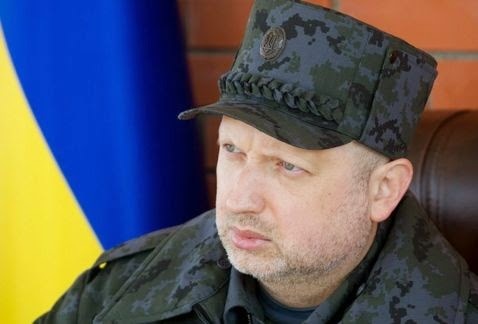 Oleksandr Turchynov, Ukrainian National Security and Defense Council Secretary, accused Ukrainian TV channel Inter of "acting against the Ukrainian state" by broadcasting pro-Russian separatist sympathizers on New Year's Eve. Anger over the New Year's Eve broadcast by Inter, Ukraine's major television channel, centers on the appearance of pop singers who support the separatist movement in the country. Government officials condemned the New Year's Eve concert, taped in Moscow, in which featured prominent singers who have supported Russian incursions into Crimea and Ukraine appeared. One, singer Iosif Kobzon, is a deputy in the Russian parliament; he appeared with singers Valeria and Oleg Gazmanov in a segment in which they stood behind a border gate and performed a song ridiculing Western sanctions against Russia. Oleksandr Turchynov, Ukrainian National Security and Defense Council Secretary, accused Inter of "acting against the Ukrainian state," and, writing on the Council's website Thursday, added that "In the New Year's Eve, when the whole nation felt unity, the Inter television channel traditionally acted against the Ukrainian state by broadcasting a concert of people who mocked our country, supporting terrorists and welcoming the seizure of Crimea and Donbas," a reference to the former Ukrainian province seized by Russia and the site of current conflict in eastern Ukraine. Yuriy Stets, Ukraine's Minister of Information Policy, threatened to introduce legislation banning all Russian performers from Ukrainian television, adding he is aware he cannot order the withdrawal of Inter's broadcasting license. One of the most reckless policies of all the administrations prior to 2014 has been the complete laissez faire attitude on Ukraine's information space. It is now reaping - in both Crimea and the Donbass (as well as in large numbers of citizens in much of Ukraine's southern belt) - the poisonous fruit of that neglect. Russia has had a free hand in poisoning the average Ukrainian resident's view of his country and government and to build up loyalties towards Russia. This, more than anything else, is the source of "regional differences" (and now conflict). Amen to the current government for its desire to put some controls on Russian propaganda. No country - western or otherwise - has allowed full freedom of the press and expression in time of war, and neither should Ukraine. So........ Ukrainians need Big Brother in order to make the right choice? You sir are a blithering idiot. Thoughtful comments from Mr. Woloshyn. I would agree that Ukraine needs to organize an effective response to Russia's thus far unchallenged propaganda machine. Of course I understand the "free press" concerns that are raised but perhaps desperate times call for desperate measures. Ideally, a free Ukrainian press could broadcast a more accurate accounting and analysis of Eastern Ukrainian news into the heart of Russia. I doubt Putin would be so popular at home if Russian people had wider access to the free press/media. There's a big difference, Scrat335, between giving free reign to a hostile force to foul your home with daily lies and propaganda about your country, fellow citizens, language, history, government, and culture, and "Big Brother's" insistence on evicting that enemy force from its information space. There is very little you know about the world around you except what you pick up in the media. If that media is twisted to suit someone's agenda, then that is the way you will see the world. Just listen to the state-generated zombies in Russia and you'll know what I mean. Only blithering idiots have difficulty making those distinctions.